There is! And, no, it's not Martha Stewart's. It's science. We've taken our cues from a few spots: a bioengineering grad student named Kendra Nyberg, who co-taught a class at UCLA called Science and Food, and chef and cookbook author Tessa Arias, who writes about cookie science on her site, Handle the Heat. There's also an illuminating Ted Talk animation on cookie science. 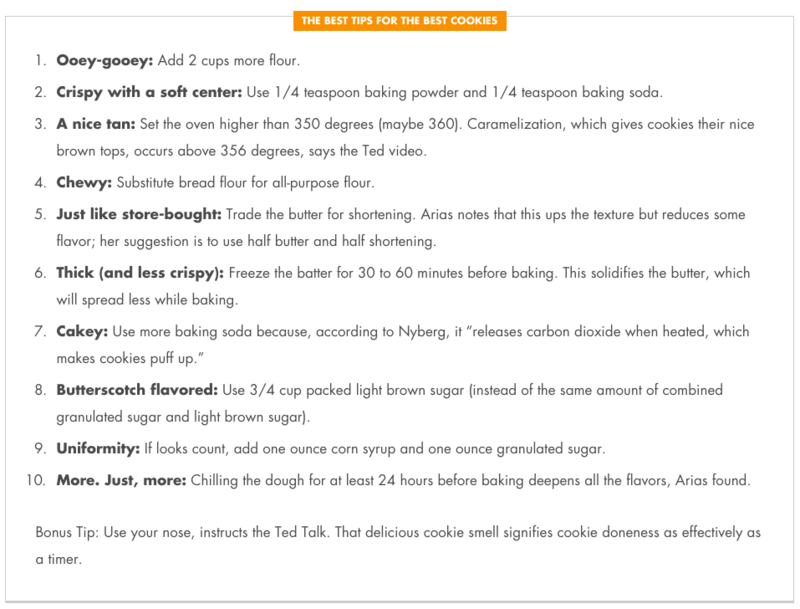 And if you really want to go nuts (or no nuts, your call), Serious Eats offers 21 painstakingly tested steps for the Perfect Cookie, including kneading times and chocolate prep techniques. Young woman eating a gourmet ice cream sandwich made at home. Vanilla ice cream in between two chocolate chip cookies. WASHINGTON, DC- APRIL 29, 2015: Catalan Marzipan Cookies With Coconut (Panellets de Coco) photographed in Washington, DC (Photo by Deb Lindsey For The Washington Post via Getty Images).